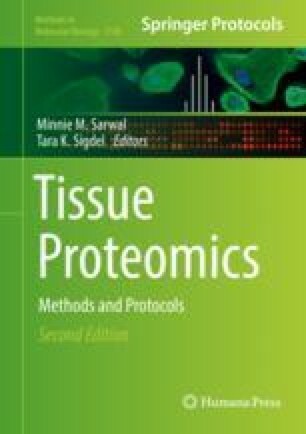 Matrix-assisted laser desorption/ionization (MALDI) imaging mass spectrometry (IMS) is a unique and well developed tool for probing the protein content of formalin-fixed, paraffin-embedded tissue (FFPE). Integral to this approach is the application of trypsin, and more recently peptide N-glycosidase F, to release tryptic peptides or N-glycans from tissue and report localization of distinct species. This is typically done on serial or adjacent tissue sections, and there is an emerging need to understand the colocalized protein population linked to the exact same regions of N-glycans. Here we describe an approach where N-glycans are first imaged from a tissue section followed by reprocessing of the same tissue section for tryptic peptide MALDI IMS. Strategies for colocalizing peptides to target N-glycans or N-glycan regions are described. This work was supported by the National Institute of Health/National Cancer Institute R21 CA185799 to RRD. PMA appreciates support from the National Institutions of Health through the National Institute of General Medical Sciences P20GM103542.